These GOT CRUISER? Add-A-Leafs are designed to give a mild lift of 1-1/2" or in the case of severely sagging will help to get you back up where you belong. Available in either a short (24") version, or a long (46") version. The short version will tend to be stiffer, and give better support for heavier loads as well as being less expensive, where as the long version will be much softer but will also be more expensive. Sold in pairs, and includes longer center spring pins necessary for installation. When installing Add-A-Leafs on the rear of a 60 series Land Cruiser, the rear rubber isolation packing and brackets will need to be removed and a "center bolt spacer" will need to be used to locate the axle to the spring. 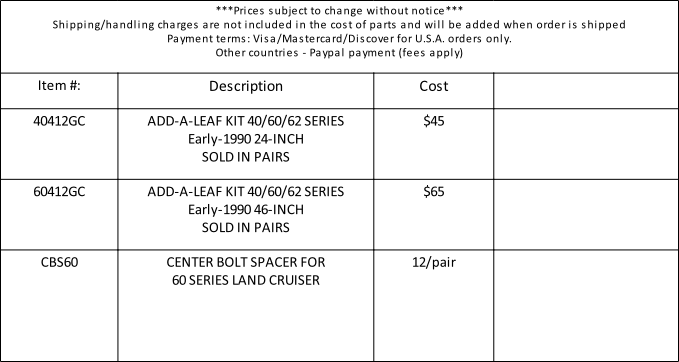 You will need to purchase 2 each part number CBS60 listed below. On 60 series Land Cruisers the OEM rear leaf springs are mounted in a captured rubber isolator system. This system should not be reused when mounting aftermarket springs. Problem is the hole on the axle spring perch is much larger than the typical center pin found on a leaf spring. The OEM isolator has a built in spacer to take up this slack and make sure the axle is properly located in relation to the axle. These bushings fit over the spring center pin and properly locate the rear springs , allowing for proper mounting of the leaf spring to the perch. Sold in pairs.